The Oahe Dam is a large man-made dam along the Missouri River, just north of Pierre, South Dakota in the United States. It creates Lake Oahe, the fourth largest man-made reservoir in the United States, which stretches 231 miles (372 km) up the course of the Missouri to Bismarck, North Dakota. The dam's powerplant provides electricity for much of the north-central United States. It is named for the Oahe Indian Mission established among the Lakota Sioux in 1874. The project provides flood control, electric power, irrigation, and navigation benefits, estimated by the Corps of Engineers at $150,000,000 per year. In September and October 1804, the Lewis and Clark Expedition passed through what is now Lake Oahe while exploring the Missouri River. Oahe Dam was authorized by the Flood Control Act of 1944, and construction by the United States Army Corps of Engineers began in 1948. The earth and shale main dam reached its full height in October, 1959. It was officially dedicated by President John F. Kennedy on August 17, 1962, in which year it began generating power. The original project cost was $340,000,000. Reservoir storage capacity: 23.5 million acre-feet (29 km³). Tours of the powerplant are given daily Memorial Day through Labor Day. Tours start at the Visitor Center, with check in at 9:30 a.m, 1:00 p.m, and 3:30 p.m. Plan an hour and a half per tour, and bring a photo ID. Groups of 10 or more should call to schedule a tour. Tours in the off-season by special appointment only. For large groups and off-season tours, please call (605) 224-5862. As a result of the dam's construction the Cheyenne River Indian Reservation lost 150,000 acres (610 km2) bringing it down to 2,850,000 acres (11,534 km2) today. Standing Rock Reservation lost 55,993 acres (227 km2) leaving it with 2,300,000 acres (9,308 km2). Much of the land was taken by eminent domain claims made by the Bureau of Reclamation. Over and above the land loss, most of the reservations' prime agricultural land was included in the loss. The loss of this land had a dramatic effect on the Indians who lived on the reservations. Most of the land was unable to be harvested (to allow the trees to be cut down for wood, etc) before the land was flooded over with water. 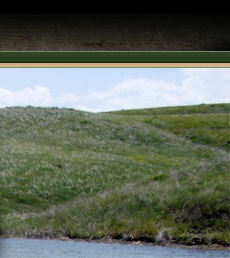 Huff Archeological Site is a fortified Mandan village site on what is now the bank of Lake Oahe. It is designated a National Historic Landmark, but is endangered by erosion pressure from the lake.